In the past 4 years the University of California, Riverside has achieved a great deal in life science research development. It has gained substantial ground in terms of the depth and breadth of its research programs, especially since the opening of its new medical school four years ago. In October 2013, neuroscientists from the Department of Cell Biology and Neuroscience at the University of California, Riverside were awarded a five-year grant of $1.7million by the National Institutes of Health to continue their visual perception research. In this groundbreaking research, UC Riverside neuroscientists aim to find new therapies for individuals with amblyopia (lazy eye), dry macular degeneration, cataracts, and other visual defects. The UC Riverside researchers also wish to develop a broader understanding of brain processes and improved treatment for patients with sensory deficits. Graduate students at the University of California, Riverside have also successfully attracted funds from the NIH. In the beginning of 2014, UC Riverside announced that a graduate student from the Department of Cell, Molecular, and Developmental Biology, Rachel Behar, was awarded an NIH fellowship of $90,000 to study smoking's toxic effects on cells. Her research is expected to help more smokers replace cigarettes with electronic cigarettes. The University of California, Riverside has rapidly grown into one of best-funded academic research markets in the nation. In 2013, the University received more than $25 million in grants from the NSF and $15 million from the NIH. This report is available free to Exhibitors at the Riverside BioResearch Product Faire™ Event held on August 27 2014. 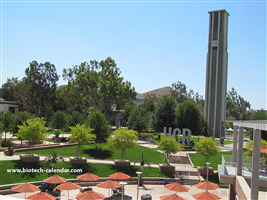 With Biotechnology Calendar, Inc.'s annual BioResearch Product Faire™ Event at the University of California, Riverside, lab supply companies will have an opportunity to network with researchers and lab managers to exchange information about the newest products and technologies. Last year the BioResearch Product Faire™ Event at UC Riverside attracted 309 attendees. Of these attendees, 47 were purchasing agents, professors and post docs, and 25 were lab managers. These attendees came from 23 different research buildings and 26 on-campus departments. If you would like to participate in this year's BioResearch Product Faire™ Event at University of California, Riverside on August 27, 2014, please click the button below to find more information. If you would like know information about other shows located across the nation, please view the National Show Schedule for 2014.